Are dummy phones turning away potential customers? Walk into just about any Best Buy or Radio Shack The Shack and you’ll see a full compliment of smartphones sitting there awaiting your perusal. In the section dedicated to Sprint, you’ll find the Palm Pre, but if you try and do any of those crazy gestures you’ve seen online, you’re going to be sorely disappointed by the display phone’s dummy status. Cathy Stauffer of Gerson Lehrman Group (a consulting firm) brought up the issue, making the interesting argument that a smartphones like the Pre or iPhone are “highly experiential devices,” i.e. you have to truly play with one to understand why you’d want one. 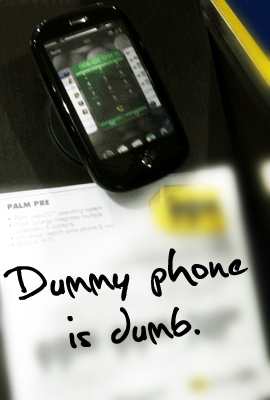 I'm thinking back, and I seem to remember an awful lot of Palm phones being dummy phones when on display outside of Sprint stores. If the only place you can do that is at a Sprint store, then Best Buy and The Shack customers are going to be left out in the cold. And standing right next to them just begging to help keep them warm? A full live working iPhone. Stauffer is right: Palm needs for customers to be able to experience the Pre and understand what makes it unique and not “just another iPhone killer wannabe.” That means getting their hands on the phone in person wherever possible, and better advertising that (as the iPhone ads do) shows what makes the phone special.